As the time travelers secretly living amongst us already knew, that previously proposed Back To The Future musical is now officially set to premiere in London. According to Variety, original filmmakers Robert Zemeckis and Bob Gale will collaborate with theater director Jamie Lloyd on the book, while Alan Silvestri and Glen Ballard will tackle the music and lyrics. In addition to the newly written score, the musical will also feature some of the film’s iconic songs like “Power Of Love,” “Johnny B. Goode,” and presumably Silvestri's catchy theme as well. 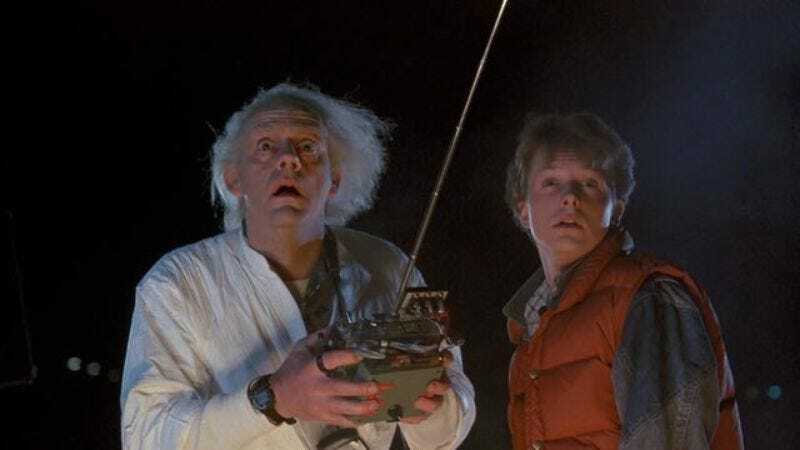 The musical will open in London’s West End in 2015—both the 30th anniversary of the film, and the year that Marty rides a hoverboard in Back To The Future II. (Get on that. scientists.) Past movie-to-musical adaptations have ranged from good (The Producers, Hairspray, Footloose) to less-than-good (Catch Me If You Can, Shrek, Young Frankenstein), but a big-name property like Back To The Future is sure to draw in tourists who have already seen the Queen musical We Will Rock You. And hey, maybe after he gets done with that American Psycho musical, Matt Smith could go ahead and bring another ’80s-era film character to the stage.